On Friday 22 November, the Centre for Ultrahigh bandwidth Devices for Optical Systems (CUDOS) hosted a showcase to present the latest developments in photonics. 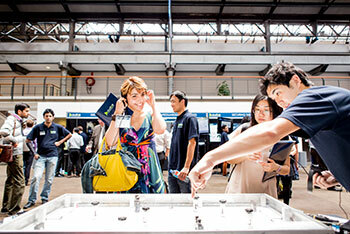 The event, entitled Photonics and Optics: Pivotal technologies for the 21st Century Australia, provided an opportunity for more than 300 industry representatives, teachers and members of the general public to learn about some of the innovative photonics research being performed at CUDOS. Optics is the branch of physics involving the behavior and properties of light, including its interactions with matter and the construction of instruments that use or detect it. Pioneered by the ancient Egyptians and Mesopotamians, optics dates back to 700BC and the development of lenses. Photonics deals with the generation, transmission, modulation, signal processing, switching, amplification, and detection/sensing of photons. It covers all technical applications of light over the whole spectrum, from ultraviolet through the visible to the near, mid and far infrared. In opening the showcase, CUDOS Director Professor Benjamin Eggleton said that photonic technology is set to bring genuine changes to the world in many areas including communications, computing, defence, health, security and astronomy. While photonics is already used in many important areas including communications, Professor Eggleton said that it is the technology that will enable positive change in a number of areas, including computing, defense, health, security and astronomy. Professor Eggleton said that photonics has matured in the last decade through massive investment in photonics technologies in the context of the global deployment of optical fiber communication system and the major advances in nanoscience and nanotechnology. “Photonics is on the cusp of causing a major paradigm shift in how we understand and use technology,” he added. Also speaking at the showcase, Dr Simon Poole, Director, New Business Ventures at Finisar Australia, explained how photonics is being used by industry. Photonics has improved capability in so many areas of life that it is almost impossible to find one that is not affected by this technology in some way. With laser being used in manufacturing for more than 50 years, beginning with sheet metal cutting and moving on to the super fast CO2 laser cutting devices that are used today, photonics is now used extensively in automotive design e.g. to power windscreen wipers, reversing cameras and enable geospatial capabilities. In the area of DNA sequencing, photonics is making it easier, faster and cheaper to sequence the human genome. The latest generation of laser based genome sequencing has brought the cost of this process down to under $100. In healthcare, laser surgery has improved many procedures, including eye treatments for cateracts and glaucoma. With the global value of this photonics estimated to be around $400bn per annum and predicated to grow by 10% each year, there is a huge opportunity for Australia to service the growing demands of the international photonics market. “The challenge for us, whether we are researchers or industry, is to build new companies and industries in Australia that can exploit the immense capabilities of photonics cross multiple areas,” Dr Poole said. Professor Eggleton said that while market penetration of photonics across Australian industry is not as pervasive as it is internationally, Australia has a very strong history in photonics and optics research. “We have punched well above our weight for many years and began to generate some world leading science in the 1990s with the development of fibre optic technology and investments in a long haul fiber network that stimulated major investment in photonics research across Australia,” he said. With many of Australia’s universities hosting world-class photonics and optics programs, Professor Eggleton said that Australia can now demonstrate the real world potential of photonics. During the showcase, a number of CUDOS researchers explained aspects of their work, including in the areas of quantum physics and Internet security, telecommunications assets, 3D nano-printing and astronomy. A new test and measurement tool that will enable the telecoms industry to develop and deploy novel transmission schemes that extract the maximum information-carrying capacity from optical fibre. The Ultrahigh Bandwidth Devices for Optical Systems (CUDOS) was formed in 2003 as an ARC Centre of Excellence and brings together approximately 160 of Australia’s best researchers across seven universities. Today, CUDOS is poised to take the next big step in optical systems by transforming photonic integrated circuits (photonic chips) into a technology that will have a profound effect on economies and lifestyles around the world.